This Time Zone Calculator converts between different time zones. To determine time zones for various locations, use this page as a reference. Note that there is no time difference between Greenwich Mean Time (GMT), which is used on the calculator, and Coordinated Universal Time (UTC). A time zone is a region on Earth that uses a uniform time. They are often based on boundaries of countries or lines of longitude. Greenwich Mean Time (GMT) is the mean solar time at the Royal Observatory located in Greenwich, London, considered to be located at a longitude of zero degrees. Although GMT and UTC essentially reflect the same time, GMT is a time zone, while UTC is a time standard that is used as a basis for civil time and time zones worldwide.1 Other time zones are computed by applying an offset from GMT, and are typically represented using "UTC" followed by an offset, for example UTC-5, UTC+8, and so on. Many countries or regions, especially those in Europe and North America practice daylight saving time (DST), sometimes referred to as "summer time," with the intent of saving energy. This typically involves advancing the time on a clock by one hour in early spring, and "rolling back" the time in autumn. Manipulating the time as the seasons change can better synchronize working hours with sunrise and sunset times in certain areas. This is less relevant for higher altitude areas (where sunrise and sunset times are significantly offset with regular working hours regardless of time manipulation) as well as locations near the equator (since there is small variation in daylight throughout the year). Neither UTC nor GMT changes regarding DST, though some countries that use GMT switch between time zones during their DST period, such as the United Kingdom using British Summer Time in the summer months. 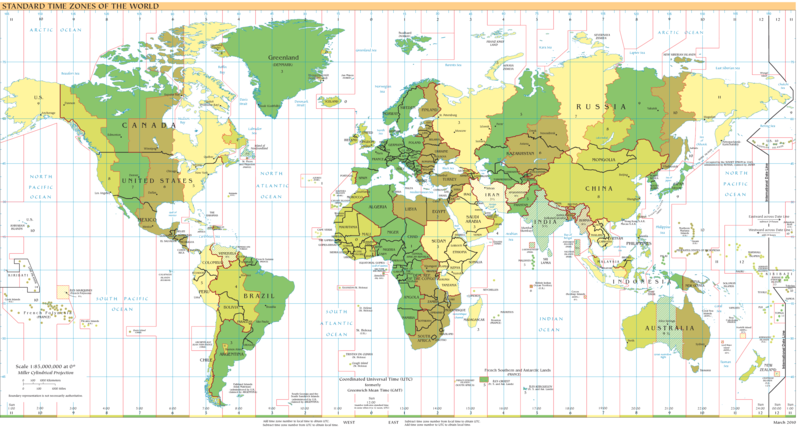 The following map displays the standard time zones across the world. Click the map to enlarge it. * This Time Zone Calculator does not consider Daylight Saving Time in its calculations.